When I first started researching and dabbling into Asian skincare, I came across various bloggers who would incorporate acids into their routine. Knowing absolutely nothing about these ‘acids’, I did my homework and found that, whilst still pretty effective, our cleansers do not get rid of the dirt and grime which lies deep into the skin, and the physical exfoliators I was using were not helping calm my acne. 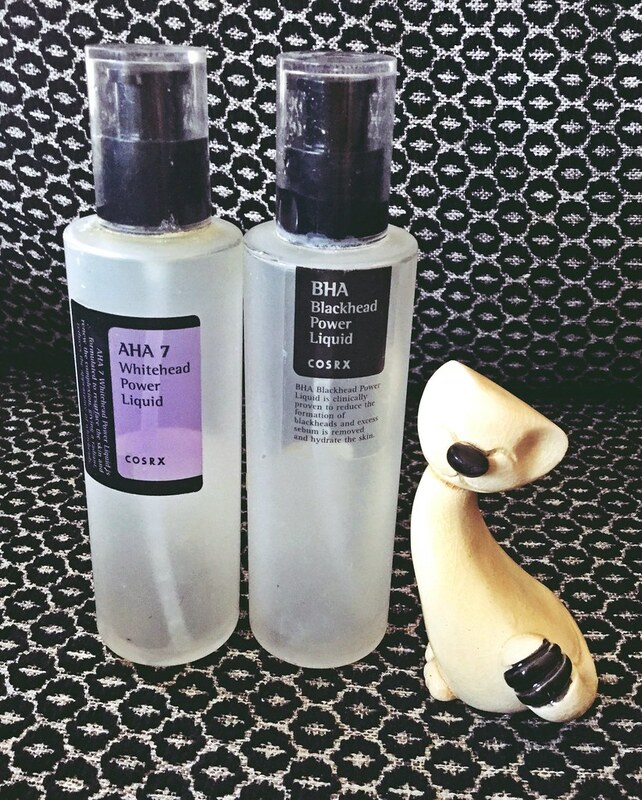 And thus I purchased the sought-after Cosrx duo – the BHA Blackhead Power Liquid and the AHA Whitehead Power Liquid..and waited until I had emptied them to review them. The AHA 7 Whitehead Power Liquid claims that it is formulated with 7% Glycolic Acid, and it gently exfoliates skin and helps reveal a radiant even-toned complexion. AHA 7 Whitehead Power Liquid includes Pyrus Malus (Apple) Fruit Water containing natural AHA and Glycolic Acid(AHA) that gently exfoliates and moisturizes skin. Other properties contained in this liquid are vitamins, and natural moisturizing ingredients that can refine without stimulating the skin. Using this helps to improve the appearance of the skin by looking it healthier and more vital. It is gentle enough on irritated and sensitive skin. This would replace your physical exfoliator. The BHA Blackhead Power Liquid claims to be clinically proven to reduce the formation of blackheads and excess sebum, and hydrate the skin. It is a 4% natural BHA component which gently eliminates blackheads and dead skin cells. It effectively penetrates into the skin and cleans up clogged pores. Also it helps skin to rebuild its moisture shield. Obviously the Glycolic Acid may cause irritation, but it also contains niacinamide which offers multiple benefits to skin. Salix Alba (Willow) Bark Water, Butylene Glycol, Betaine Salicylate, Niacinamide, 1,2-Hexanediol, Arginine, Panthenol, Sodium Hyaluronate, Xanthan Gum, Ethyl Hexanediol. The only trigger for the BHA, which is also in the AHA, is the Ethyl Hexanediol which is a solvent that then gets eliminated by the body naturally. These products retail for circa $13 or €12. I usually purchase mine off ebay. I usually use these at night after I have cleansed my face and used a ph balancing toner. 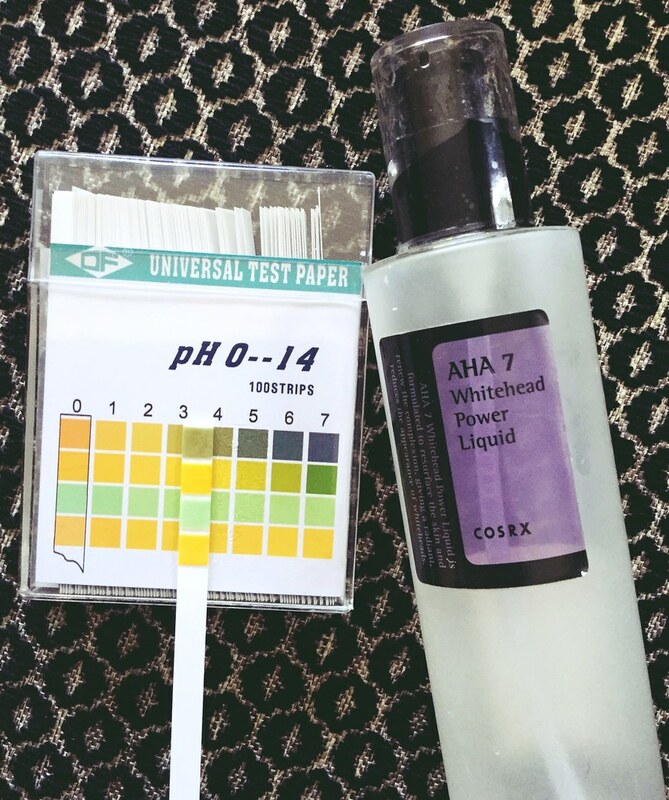 It is key to take note of the ph of your cleanser and your toner. If you are using a cleanser with a ph of more than 6, then your toner would need to lower the ph of your skin so that these products could then work their magic. (I am currently using the Cosrx Natural BHA Skin Returning A-Sol Toner which I will review soon) If you do not use a ph balancing toner or at least wait for 10 – 20 minutes before applying these products then their performance would diminish because they would be working to get the ph of your skin to its natural value before they start to work to exfoliate or remove your blackheads. 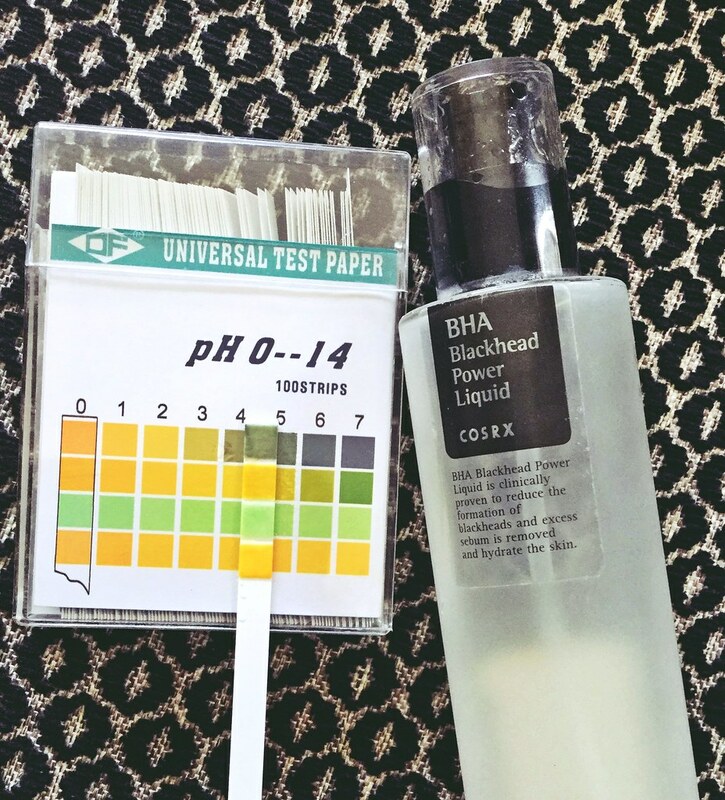 As you can see below, the ph of these products is acidic, and thus they will not work well if you use a toner with a high ph. Do not expect them to work if you do not help them achieve their full potential. Both products come with a pump, with the AHA being a bit more liquidy than the BHA. The BHA feels slicky and when you apply it on your skin you will feel it sitting on it until it starts to sink in. The AHA glides on and sinks in quite quickly, and you may experience some tingling on the skin, beware that it is a slight tingling – if it starts to burn wash it off immediately. I also recommend not to use it in conjunction with another exfoliator on the same night or you use it after you have shaved your face (yes, I shave my face, a blog post for another time). You need to let the products sink into the skin properly and work for at least 10-20 minutes before you continue with your routine hence I suggest using them at night. AHA is a chemical exfoliant and makes your skin photosensitive so if you don’t use a sunscreen please start doing so if you intend on incorporating the AHA in your routine. Moreover, I would recommend starting slow, maybe use the AHA three times a week on the days you don’t use the BHA, also in view of the fact that you would need at least 30 minutes to use both products at one go. If you do decide to use them at one go, remember that the BHA has to be used before the AHA. If you intend on using them on the same night then start off with the BHA as it sinks into the pores. The AHA lies on top of the skin, and if you start with that first it will inhibit the BHA from sinking into the skin. I have been using these products for a long time and I did see some improvement in my skin. When I would skimp on using the BHA for a week and not use a clay mask I could see and feel my pores are clogged. The BHA should not replace a weekly clay mask, but it does help in minimising blackheads in the long run. I did not like that it made me feel a bit greasy after using it, and I had opted to use the COSRX BHA cream after the 15 minutes are up (which is also quite greasy, but that is a review for another time), or else use a micellar water to remove the BHA off my skin before using a moisturiser. Upon first using the AHA twice a week, I experienced breakouts and was thinking of discontinuing my use of the AHA, but then I realised that it was helping my blemishes dry and making my skin feel smoother and less bumpy. I did feel it was a bit too much for my skin, as when I would forget to put on moisturiser or hand cream I would wake up with flaky skin and very dry hands. I am currently using other products, albeit for review purposes, but I do not think that I will be repurchasing these, especially the BHA, if the other products work out.